One of the most collectible American designers, Paul Evans is a mid-century modern master. His innovative designs are polarizing for fans and skeptics, but it’s an undeniable fact that his pieces, particularly the Cityscape line, are selling for significantly higher than the estimates and are being collected by major celebrities. Diane von Furstenberg, regarding her collection of Paul Evans credenzas. Evans began his career working at a Massachusetts museum as a silversmith. He took this traditional training to New Jersey in the 1950s and used his skills to begin sculpting furniture. After growing popularity of his styles and success in his storeroom, Evans and his team began producing for Directional Furniture. What came from this collaboration, the Cityscape line, helped distinguish Evans as a true innovator and designer icon. Every piece in this line was handmade with direct supervision or by Evans himself, and he took painstaking steps to maintain the mastery of his craft. This attention to detail is undeniable, and pieces are essentially museum-quality sculptures. Currently enjoying a resurgence in popularity, this coveted collection is easily identifiable, distinguished, and increasingly soaring in value. His works continue to stun collectors as pieces break auction records, even as his designs draw disgust from critics. 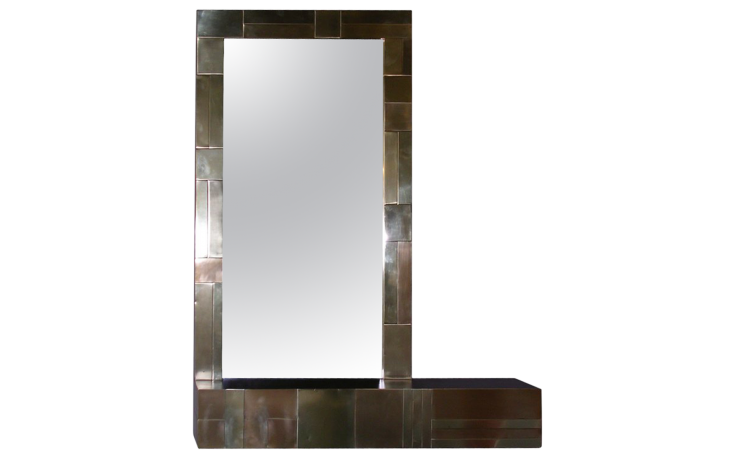 Lenny Kravitz, a collector and fan, has described Evans’ pieces as stunningly beautiful, stunningly ugly, stunningly tacky, stunningly sophisticated. To us, that boils down to a solid praise and a perfect explanation of fascinating. Take a look below to find yourself captivated by the compelling and alluring pieces of the Cityscape line. Unmistakably Paul Evans, this set of two side tables are where function meets fashion. They’re a perfect visual balance with mixed metals offering a solid and heavy structure, but a unique shape that somehow feels buoyant. A bold pop of color makes this sofa the epitome of a statement piece. Custom Hermès leather upholstery is an ideal complement to the mixed metals of the Cityscape base. It’s fun and quirky while still maintaining the utilitarian, Brutalist style so favored by Evans. This coffee table particularly displays Evans’ Cityscape vision. While other pieces in the collection are thick clusters of chrome and brass, the openness of this design makes his skyline inspiration clear. It’s not easy to make mixed metals look airy, but with a glass top and peach base anchor, it’s mission accomplished. In what certainly is a unique pairing, these striking figures expertly blend two very different styles. 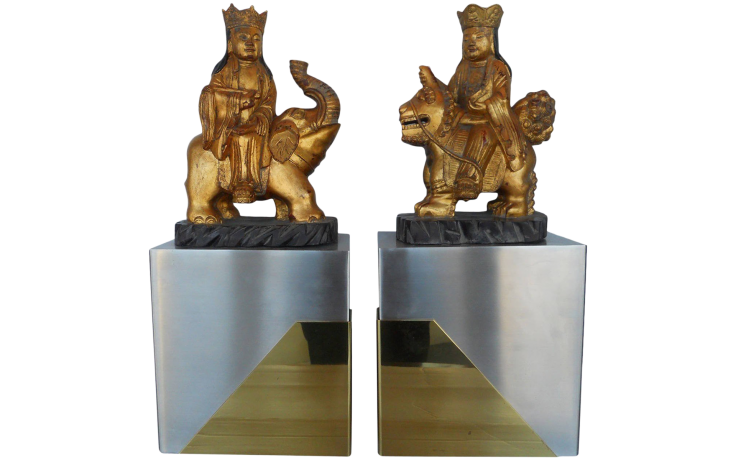 Hand-carved gilded Chinese figures mounted to a geometric, angular, and severe pedestals? A brazen move with lots of payoff. When displayed in homes, the Cityscape line delivers drama, and creates an edgy, moody vibe. This daring piece is no different, yet seems to float in space. Guaranteed to command attention, add it to any corner of your home that needs a heavy boost of energy.